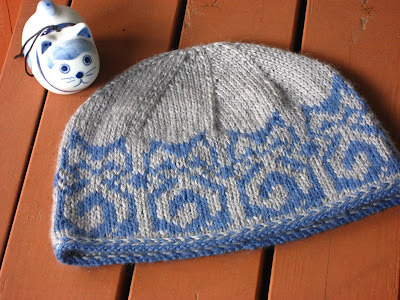 Once I decided to design a cat-themed hat, I became a little obsessed. 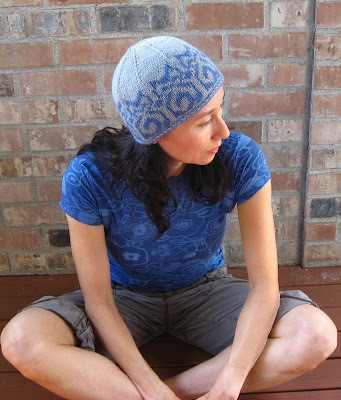 Originally I was going to knit with a traditional pattern gleaned from one of my books. But the heads seemed to be lacking something, namely, a body, and I think this pattern looks a little menacing. I wanted purring, not hissing, cats. So rather than traditional, I decided to be original. Imagine that! After several overly complex sketches, I blocked out a simple shape. 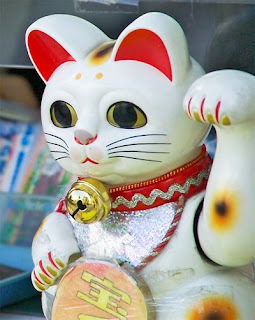 These cats look naive and sweet, like a cross between a Maneki Neko (beckoning cat), and a pixelated kitty from a classic video game. I've named the hat "Temple Cats" in honor of one of the legends of Maneki Neko, and because everyone loves a pun. I'm fond of the curling tail. 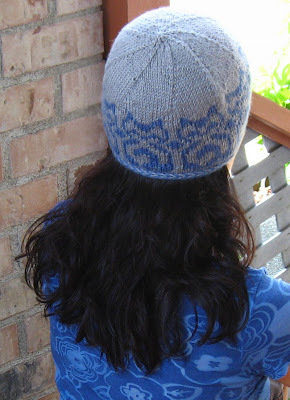 *1/21/10: This pattern is now being offered at Knit Picks. 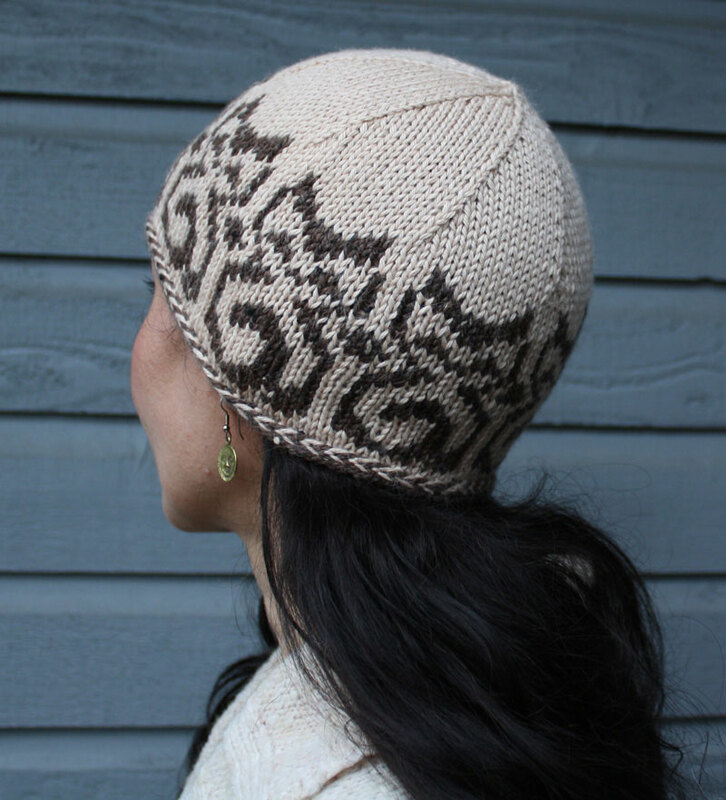 This pattern is suitable for intermediate knitters. The directions assume that you are familiar with stranded knitting. Hat pictured is size m, worn with 2 inches negative ease. Yarn: Knit Picks Elegance, 1 (1, 1, 2) skeins of Ash (MC) and 1 (1, 1, 1) of Cornflower (CC). 1/21/10: Since Ash has been discontinued, I recommend substituting Knit Picks Andean Treasure in Fog Heather for the main color. Needles: US 4/3.5 mm circular, US 6/4.0 mm circular and dpn’s. If needed, change size to obtain gauge. Gauge: 22 sts and 26 rws over 4 in/10 cm, in stockinette st, after blocking. Purr, purr... What a clever hat! A nice colour combination. Love the hat! It's gorgeous! When is a cucumber not cool?